One FREE Edge to Edge Quilting up to Queen size! Drawings for smaller prizes will be on a random basis. Linda Kaplan of Gresham, OR. Longarm Quilting with personal consulting to showcase your Quilt Top. 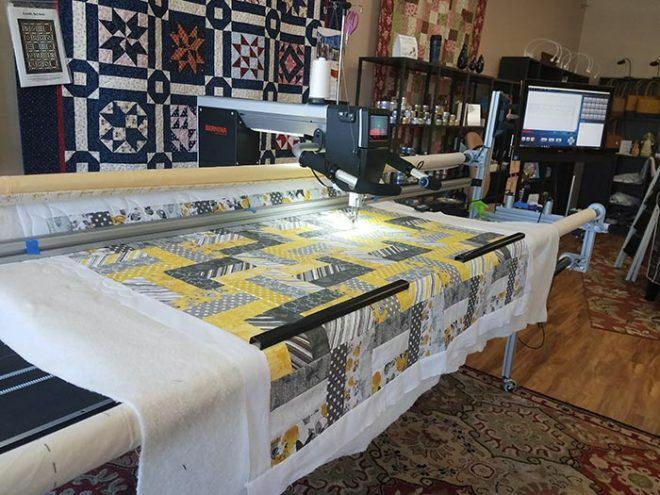 Knowing the love and amount of painstaking labor our customers have put into their Artistic Quilt Top creations, we make every effort to compliment your quilt project with a superior quilting process. We own a top of the line Bernina Q-24 Longarm machine combined with a Bernina Q-Matic Computer controlled quilting system, mounted on a 12ft frame. This allows us to mount and sew tops up to 106” wide. We have most popular pattern designs for you to choose from or we can download most commercially available designs. We would welcome any questions you have and the opportunity to help you complete your Quilt project. Our goal is to be as proud of the quilting service we provide as you are of your artistic quilt top creation.